It was four years between Volumes One and Two in Scott Michael’s excellent series but it’s been only a few months between Volume Two and the release of Volume 3. Obviously the four years since Volume One have been well spent. This volume continues the high standards that Scott set for excellence in identification photos and expert text and the publisher, Microcosm, again shows the commitment to production values that have made this series beautiful as well as valuable for serious aquarists. Like Volume Two, this one does not include the important general information on coral reef ecosystems, reef fish diversity and adaptive strategies, predator-prey relations, and mating and social behavior that he presented in his first volume. There are a few introductory pages on anatomy of bony reef fishes and a map of the world’s major coral reefs but to experience the full value of the author’s expertise it will be necessary to acquire that first book. The new volume, like the previous ones, generously shares the author’s years of experience with these species both in the wild and in captive aquarium systems. He provides detailed information on feeding, social behavior and compatibility, captive care and superb identification photographs. Volume 3, like Volume 2, opens with “The Fishes,” which gives the general plan of the volume. As in the previous volumes, Michael gives the scientific name and one or more common names; the informal name most frequently used by ichthyologists as well that used by most hobbyists. He follows with the maximum length attained by the species and its range. This is followed by a description of its biology, including habitat, depth, food and feeding patterns, reproduction and social organization and special relations with other species. He provides captive care and husbandry information, along with suitability for the invertebrate aquarium and any captive breeding information available. He follows with minimum suitable aquarium size and the temperature range required by the species. His Aquarium Suitability Index, with scores from 1, indicating those species which are “almost impossible to keep,” to 5, for those species which are “very hardy with almost all individuals readily acclimatingto aquarium confines” is of critical importance for those contemplating adding specimens to their aquaria. This index is being used by other references and may well provide standards by those interested in reducing the trade in the “almost impossible to keep” category. All in all, Scott Michael’s extensive personal experience, combined with his coverage of the relevant scientific literature make these volumes the most important comprehensive works available on marine fishes. This series will be of interest not only to aquarium hobbyists but to aquarium professionals as well – indeed to all those interested in the lives of reef fishes. Although the highly prized Angelfishes and the tempting Butterfly fishes are those in the title, there are number of groups discussed before these are covered in the text. The first group presented is the interesting but rarely kept Remoras (Family Echeneidae), symbiotes of the sharks. The particular form of symbiosis is known as phoresis, in which one animal is carried by another. These fishes have a unique specialized organ on top of their heads, which they use to attach to their larger host. Two species may be seen in the aquarium trade. Michael, who apparently knows, says of them, “Suckerfishes can make interesting pets…and can easily be trained to accept food from you fingers. A suckerfish may even attach to your arm as you clean the front glass but fear not – it will release harmlessly as you raise your arm from the water.” Now there’s a glass-cleaning experience to have! The Jacks, Scads and Pompanos are next (Family Carangidae) a group that Michael calls “the ruffians of the coral reef community.” Active predators that grow too large for the home aquarium, they are often stars of large reef tanks in public aquariums. I’m lucky enough to care for three young Amberjacks ( Seriola dumerili ) in the aquaculture exhibit area I maintain at the Natural Energy Laboratories of Hawaii Authority (NELHA) on the Big Island of Hawaii. They’re interesting and exciting pets with enormous appetites. Bright yellow- striped juvenile Golden Trevally (Gnathanodon speciosus) are often seen in dealer’s tanks. They are hardy, but reach a maximum of four feet in length. These fishes need a large tank! A section on the Snappers (Family Lutjanidae) follows. These fishes also become large, requiring tanks of more than 180 gallons. They may also pester less aggressive tank mates. Michael says of the beautiful Threadfin Snapper ( Symphoricicthys spiluris ),” This glorious fish makes a stunning display in a very large home aquarium.” They will eat ornamental crustaceans and small fishes. The Fusiliers, (Family Caesionidae), rarely encountered in the aquarium trade, are next. The Whiptails and Spinecheeks (Family Nemipteridae) follow them. The attractively colored Blue Whiptail or Banana Fish is the most common member of the family in the aquarium trade. This family feeds from the substrate surface, so their tank should contain a two-inch sand bed. Their feeding habits will keep the substrate stirred. The next group, the Drums and Croakers (Family Sciaenidae), include attractive, nonaggressive species like the Highhats that are difficult to maintain. Michael describes the next group, the Goatfishes (Family Mullidae) as difficult and demanding aquarium residents. A section on the Sweepers (Family Pempheridae), “nervous, active fishes that are often quite delicate,” follows. The Monos (Family Monodactylidae), more familiar to freshwater or brackish-water aquarists, are next. These fast moving fishes can be easily acclimated to seawater. They need a large tank with refuge areas. After 122 pages discussing families of limited interest to home aquarists, we come to the Butterflyfishes (Family Chaetodontidae). The diet of most species of this family consists of benthic invertebrates although there are a few omnivorous species. Many are highly specialized feeders on stony coral polyps or soft corals, some even feeding only on particular corals. Some species, however, readily acclimate to aquarium life. All are sensitive to water quality. Michael divides the family into three groups. Group 1 species readily accept prepared aquarium foods. Group 2 species are reluctant to do so initially, but can learn to eat substitute foods. Group 3 never feed in captivity unless offered their natural prey species. He says, “_The butterfly fishes in Group 3, which consist primarily of obligatory stony-coral eaters, should not be purchased by any marine aquarist, no matter how experienced._” (Author’s italics). He presents an extensive table, listing members of each group onpage 125. For the advanced aquarist wishing to maintain specimens from this family, this table alone, and the 88 pages of highly informative text surrounding it, may be worth the price of the volume. The next and last chapter, 113 spectacularly illustrated pages on the Angelfishes (Family Pomacanthidae) added to the chapter on the Butterflyfishes certainly clinch the deal. The first genus discussed is Apolemichthys, which includes hardy species like the Red Sea Angelfish and the difficult Bandit and Flagfin Angels “unfortunately common in the aquarium trade.” The Centropyge group, the Pygmy Angelfishes, is the largest genus in the family, containing approximately 30 species. These species typically thrive in minireef systems with live rock and natural substrate to provide algae and tiny crustaceans, and with holes and crevices to provide cover. There is significant interest in captive breeding of these beautiful fish, with Flame Angels ( C. loriculus ) and Potter’s Angels ( C. potteri ) at the top of the list. As I have reported, C. loriculus has been successfully bred in numbers by aquaculturists at NELHA, but as with the case of somany potential advances, it’s hard to compete with the price of wild-caught fishes. I host one of the few aquacultured Flame Angelfishes in my home aquarium. Aquarists must start to be willing to pay premium prices for these hardy, already acclimated specimens. Scott Michael includes in his enormous range of photographs many other very important illustrations of local variations in color pattern, developmental changes in coloration from juvenile to adult forms, male and female coloration in dimorphic species and known hybrids. We can only hope that Volume 4, which will focus on Wrasses, Damselfishes and Blennies as well as Dragonettes and Parrotfishes and Volume 5 covering the Triggerfishes, Surgeonfishes, Gobies, Rabbitfishes and Moorish Idols, will appear soon. A final Atlas promises to present a comprehensive photographic index to the five volumes and cover aquarium Sharks and Rays. 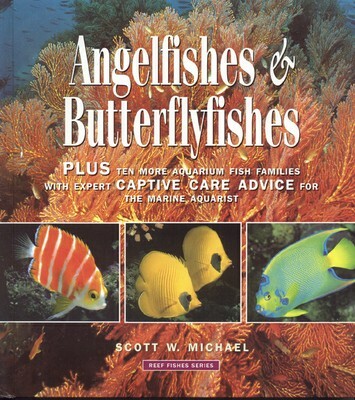 As I’ve said before, this series is invaluable for all those of us who, like Scott, believe that “A coral reef or a marine aquarium without fishes has been likened to a garden without birds or butterflies.” This series is clearly the finest available on the subject and the most important addition to the aquarist’s library this year. Get them as they come out. If you haven’t, start now. They’re as beautiful as they are informative. Feature Article: Too Much Light!